The Packers struck for two big plays to break a 10-all tie late in the second quarter, but the Vikings answered with a TD drive of their own to make it 24-17, in favor of Green Bay, at the half. First, QB Aaron Rodgers found WR Jordy Nelson over the middle on a third-down slant, and Nelson broke into the clear, going 76 yards in all for the touchdown to put the Packers on top 17-10. It was Nelson’s second TD catch of the first half and came with 3:38 remaining before halftime. 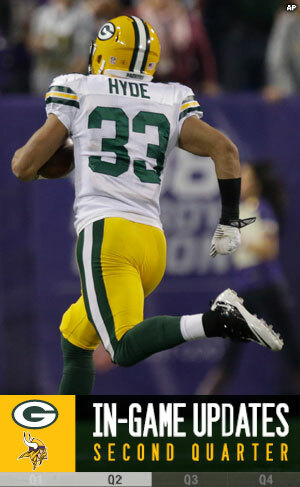 Then, after the Packers defense got a three-and-out, rookie CB Micah Hyde returned a punt 93 yards for the score, making it 24-10 with 1:30 left in the half. The 93-yard return is tied for the fourth longest punt return in team history. The Vikings responded with a 77-yard drive for a TD, helped by a pass interference penalty on CB Tramon Williams on a deep ball to WR Greg Jennings. RB Adrian Peterson ran it in for the score, from 8 yards out, with just 4 seconds left in the half to pull the Vikings within 24-17. Tied at 7 after one quarter, the Packers had taken a 10-7 lead on a 30-yard Mason Crosby field goal, which capped a 17-play, 70-yard drive that consumed 8 minutes, 24 seconds. Green Bay converted a pair of third downs on the drive, and then, after failing on a third-and-1 run by Eddie Lacy, converted on fourth down with a 7-yard pass to FB John Kuhn. Lacy then burst through the middle for 17 yards, putting the ball on the 11, but a third-down sack of Rodgers by LB Chad Greenway led to the field goal. The Vikings re-tied the game on a 36-yard FG by Blair Walsh. The drive was helped by a critical personal foul penalty on Packers DE Datone Jones, who shoved Vikings T Phil Loadholt well after Christian Ponder’s third-down pass was incomplete. The fresh set of downs, followed by a 17-yard pass on the next third down to TE Kyle Rudolph with Ponder under heavy pressure, got the Vikings into field goal range. CB Tramon Williams nearly picked off an out route intended for WR Jerome Simpson right before the field goal try.